Some Alberta Mounties are calling on the federal government to resolve longstanding issues around wages and working conditions that are leaving officers overworked, fatigued and poorly compensated, says one RCMP member. A group of Alberta Mounties is calling on the federal government to step in and resolve longstanding issues around wages and working conditions that are leaving RCMP officers overworked, underpaid and exhausted, says one member. Cpl. 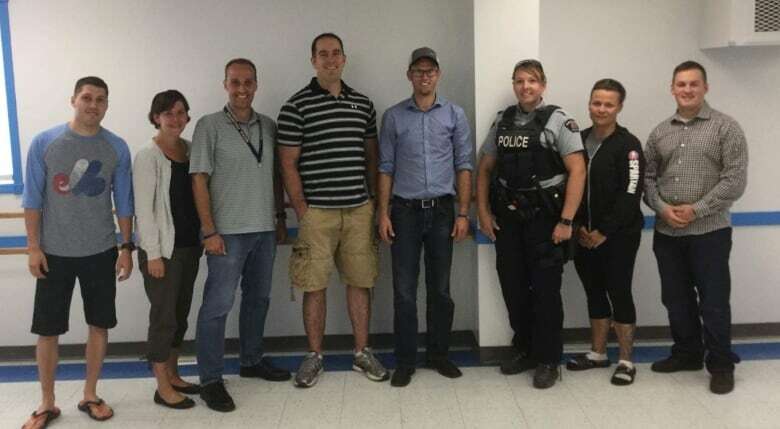 James Smith in the Valleyview detachment was among six members and three of their spouses to meet with Conservative MP Arnold Viersen Tuesday. He defied the RCMP Act by speaking out publicly about problems he sees plaguing officers but insists the consequences of remaining silent are greater. "We're burning out, we need help on the front lines here," said Smith, who accused management of failing to acknowledge problems or communicate them to Ottawa, forcing members to seek assistance from members of Parliament directly. "We're truly in a state of crisis. Evidence of that is everywhere." In April, Smith joined thousands of Mounties across the country who removed the yellow stripes from their uniform pants in protest after the federal government announced a new pay package falling short of expectations. Many officers also signed up with the National Police Federation, giving the group enough members to file an application to certify their own union. The Quebec Mounted Police Association has also applied to represent members in that province. Problems, however, go well beyond the latest compensation package, said Smith, explaining resources have failed to keep pace as expectations continue to grow. He said police calls that used to take minutes now last hours, while RCMP lack a strategy to backfill maternity or sick leave. Instead, said Smith, those responsibilities are heaped on remaining staff in addition to existing duties, as they attempt to maintain a high level of service. "And that's killing us," said Smith, a 10-year veteran who warns that members with just two years experience are "getting fatigued and bitter" due to the heavier workload. "I think it's a big public safety issue," he added. "We are first responders. We respond to some pretty bad calls for service, life or death situations. Having your police officers well rested and in good shape and in good mental health — to me that's crucial." In a written statement, the RCMP office in Ottawa said it is aware of Tuesday's meeting between Smith and Viersen. "The RCMP is aware of the members' concerns, and steps are being taken to review current procedures and to make recommendations for change," wrote spokesperson Sgt. Harold Pfleiderer, emphasizing the organization's commitment to ensure the safety of its members and commitment to protect the public. Pfleiderer noted that Bill C-7 received Royal Assent on June 19, establishing a new labour relations framework that will allow the RCMP and a future union to address concerns. "In the meantime, members are encouraged to raise any workplace issues they have with their management," said Pfleiderer. Public Safety Canada did not respond to a request for comment but Minister Ralph Goodale previously expressed support for the pay package. Viersen's office provided a brief statement: "He's happy to meet with constituents and hear their concerns," said a spokesperson. The group told Viersen about the toll conditions are taking on their families as regular overtime keeps them apart. "As a father I feel disappointed in myself," said Smith, a dad with two young children whom he hopes to spend more time with in the future. Members also raised concerns around uniforms and equipment at Tuesday's meeting, said Smith, noting some police cruisers are on the roads "long after they should be in operation." Smith said he has been waiting eight months to replace the 10-year-old "duty belt" he wears to carry various tools of the trade. And he's also heard stories of cadets sharing breeches in parades. "When your cadets have to share pants for parade duties — that's embarrassing," he said.